CHED Exec Director Atty. Lito Vitriolo, officers and members of PSITE, ladies and gentlemen, good morning. In my first time to attend the PSITE StratPlan as board member last year, I was asked of my expectations as board member, my answer was, I wanted to see a working board , now I wanted a working board in ACTION.. so PSITE PReParE! I am very moved to feel the confidence that the members from all parts of the nation have shown towards me in electing me as President of the Philippine Society of IT Educators. On behalf of the newly elected members of the PSITE Board, I stand before you, humbled by this honor of being elected to the Board and the Presidency of PSITE. It is an honor, but, more importantly, it is a big responsibility and the challenges are great and sometimes, it seems, insurmountable. As you may already know, PSITE’s goal is furthering IT education. And education is not an easy task, especially in these modern times when rapid changes happen at the blink of an eye. In the coming years to come, I see that PSITE will face many more and bigger challenges. It is for this reason that we should all PReParE. P stands for Professionalism. As Edwin M. said during the 11th national Convention, Order in the House …First Things First ..By professionalism I mean three things. First, maintaining composure and decorum. It is good to have order in everything we do. Second, is proper documentation. My presidency is not forever. Therefore, for the present and future board and officers, this will serve as their guide. Third, is dedication to responsibility and duty, this need not be said because this is expected of each and every board and officers. I just mentioned this to emphasize. When completed and approved, this will be presented to the general assembly for ratification. Our activities will now be project-based that will be taken cared of by project leaders. The activities of the projects will be posted in our e-groups so that everybody will get updated. At this point, let me bring you back to what transpired during the last national convention. If you will recall, the themes that we had that time were ICT Directions in the Philippines by CICT, Addressing ICT Education Gap Through Partnership by Mam Fe, Changing the Mindset: Employee to Employer (Technopreneurship) by Dickie Gonzales of PESO, and Best Practices. The Best Practices were based on the TRIAD function of an educator which is Research and Development, Extension and Linkages and Curriculum and Instruction. In this administration, I would like to focus on Research. I am hoping that the next administration next year will set their eyes on extension and curriculum. This is the “Re” of my PReParE. Re stands for Research. Since we are educators, I would want to stress research in my agenda. This is one of the key result areas by the past administration and I would like to give it more focus and have a developmental approach to it. Following the NCR chapter framework, we may have an IT Research Development Workshop in the regions, followed by IT Research Methods and Assessment and then IT Research Funding and Intellectual Property. 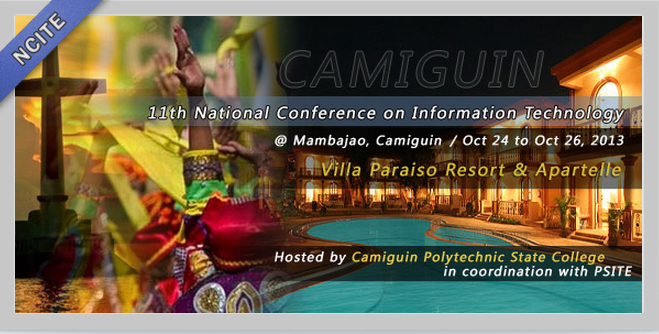 We hope to organize island research presentations (we have MCITE already in Mindanao, NCR can be expanded to LCITE and organize VCITE) during the MCITE, VCITE and LCITE, which will be supervised by the Island Vice-Presidents sometime in December, this year. 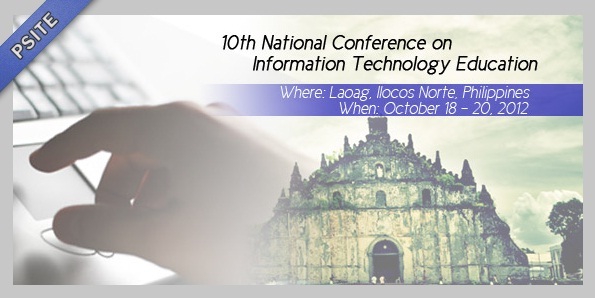 The output of the NCITE and island researches will be published in the Philippine IT Journal which will be distributed during the National Convention next year. Par stands for Partnership. PSITE cannot stand alone. We have been partnering with others organizations, come up with a MOA, which may be local or national in scope. I am looking forward to the leadership of our VP-External Sir Bart Tanguilig, to identify possible partners and draft terms of references. I have initiated some partnering activities (AVANTE, IBM, PLDT, MICROSOFT, CISCO, TechnoFrontiers, etc ) which I will have to discuss anytime during this workshop. We can come up with a partnership to educate others. This leads us to the last Ein the word PReParE. E stands for the very purpose of our organization, which is Education. Aside from educating and capacitating our members, I was thinking of participating in educating voters. Automated election is in the air now and I think we can take part in this. The Island VPs composed of Sir Reginald Jay Hidalgo-VP Luzon, Sir Gregg Victor Gabison-VP Visayas, and Sir Edwin Marañon-VP Mindanao could surely help us on this. So PReParE means Professionalism, Research, Partnership and Education. This is my administration’s thrust and I hope this will also be the thrust of the regional chapters. This will also be the main themes for the workshop. The outputs in the workshop will be published in our egroup for transparency and guidance. This is just a jumpstart and hope that we can have a good takeoff. I hope that you all will be one with me in achieving our goal to further IT education. So let’s all start preparing ourselves. Let us give our best. According to American author H. Jackson Brown Jr, the best preparation for tomorrow is doing the best today. Good morning. CONGRATS sir! we're so proud of you...!